Keeping a notebook handy is a great practice, which is why Moleskine and similar style pocket journals are so popular. These slim blank books are the perfect place to jot down ideas, keep track of important things to remember, or simply keep notes from the day. 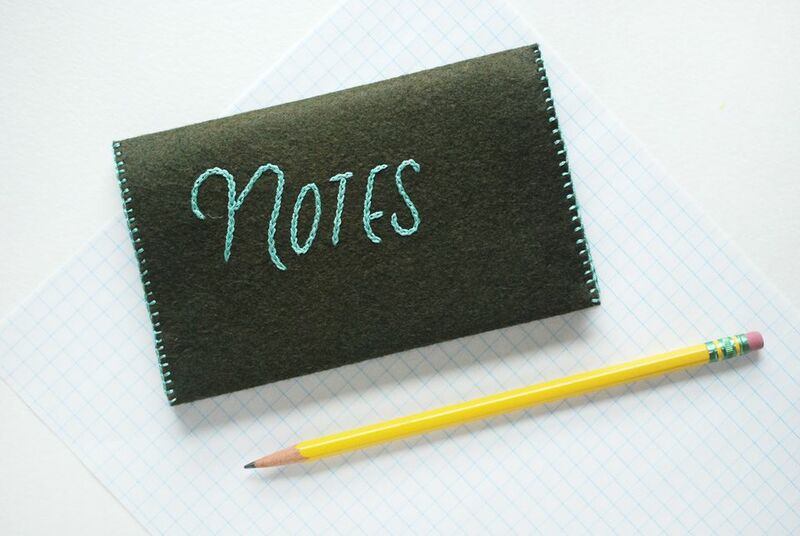 With this easy tutorial, you can create an embroidered cover for your own notebook. While they come in many styles, most are fairly plain. By stitching a felt cover, you can not only embellish the book, but also protect it for when you toss it in your bag. It's also removable, so when you fill up one journal, you can move your cover to the next! You'll find these notebooks in the stationery department, and many companies make them. The instructions for this tutorial are based on working with a standard pocket-sized book, which is 3.5 x 5.5 inches. You can easily adjust the measurements to fit any size you like to use. Please note: It's helpful to read through all of the instructions before you begin. You will also need a pattern. Create your own with your handwriting or by typing "Notes" in a favorite font. You can also use the download the pattern I'm using. 1. Cut the felt to size. If you will be using water-soluble stabilizer for marking your pattern, it's a good idea to cut the felt a little larger than the finished size. This is because when you soak it away, the felt may shrink slightly. Cut to 6.5 x 10.5 inches. If you will be using tissue or tracing paper for marking your pattern, you can go ahead and cut the felt to the final size. Cut to 6 x 9.75 inches. 2. Trace the pattern onto the stabilizer or tracing paper, then stick or baste it to the felt. You can place it wherever you want, but you may want to fold the felt in half to see where the pattern will be in relation to the notebook spine. 3. Embroider the design. For mine, I used chain stitch with three strands of embroidery floss. Use your favorite stitch and embellish it as much or as little as you want. 4. Remove the pattern material. If you used water-soluble stabilizer, you will need to soak the embroidery. Wool and wool blend felt will shrink in warm water, so use room temperature water. Press excess water out with a towel, and then dry flat. Press with a warm, dry iron. If you used tracing or tissue paper, carefully tear away the paper, removing all bits from under the stitches. 5. If you haven't already, trim the felt to 6 x 9.75 inches. A rotary cutter is helpful for this, but you can mark and cut with a scissors. Fold and press the rectangle in half, then fold the two ends to the wrong side of the embroidered felt. Each folded flap should measure one inch. Pin the flaps at the top and bottom. 6. Using three strands of floss, stitch along the top and bottom edges with blanket stitch. Running stitch or whip stitch would also work for this. Stitch across the flaps to hold them in place, and along the plain edge for finishing and decoration. Secure each end with knots hidden inside the flaps. 7. Slide the notebook into the cover and you're ready to keep notes in style! When the journal is open, the cover will feel a little loose, but once it is closed it should fit just right. To make a cover for a larger journal, measure the journal while it is laying open and flat. Add .5 inch to the height, and about 3 inches for the width, depending on the thickness of the notebook. Wrap the felt around the book while it is closed to get the measurement for how wide the flaps should be. These covers also make great gifts. You can customize the embroidery with the recipient's name, then include a couple pocket journals and pencils. Now you'll always be ready to jot down your next embroidery project idea or make a list of the embroidery threads you need to replenish!